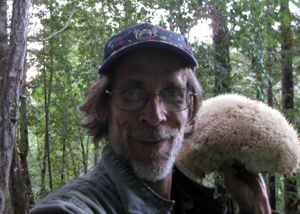 Keeper Trout with a head-sized Hericium. 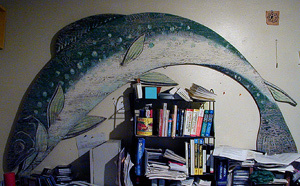 Keeper Trout (aka "Trout", "K. Trout", and "Keeper of the Trout") is an independent scholar and author. Although his university education in Texas focused on chemistry and microbiology, for the past two decades he has been studying altered states of consciousness, while compiling, cataloging, commenting on, and researching psychoactive plants. He has written and published numerous densely informative pamphlets and books on these topics, as part of his "Trout's Notes" series. In 1995 and 1996, Trout penned the advice column "Ask Barney" (under the pseudonym "Barney Heffter") for the final two issues (#8 and #9) of the fringe magazine Crash Collusion. From 1998 until its demise in 2008, he acted as Technical Editor for The Entheogen Review and its sister publication in Germany, Entheogene Blätter, which was published between 2002 and 2007. Assorted book reviews by Keeper Trout posted to Erowid, including reviews of Conspiritor by Floyd Davis, The American Disease: Origins of Narcotic Control by David F. Musto, and Psychedelics Reimagined edited by Thomas Lyttle.